Well, what a surreal few weeks. Sorry for my silence and lack of content [if anyone's even noticed, aha] - I went into hospital for an operation a couple of weeks ago which should have kept me in for just a couple of days, but unexpected complications have meant I've pretty much moved in now haha. Except it's not that funny, I'm proper DESP to come home and madly embrace my duvet, a block of cheese [seriously mature, obv] and Clive for a few days. I've been able to see the funny side and I've befriended the Kitchen Staff who now sneak me extra toast and grated cheese [a couple of the finer things in life, like] - as well as every other human I've encountered during my time in here. I know about people's pooing problems, the kitchen lady's fella's testicles and the cleaner's haemorrhoids - so overall, it's been pretty funny and definitely not a bad experience, considering how scared I am in reality of hospitals. NHS slaying life, once again. This is going to be slightly less smooth of a transition as I'd planned, as one of the last things I mentioned here was a bumhole inflicted ailment... BUT I'll go with it - as in addition to the NHS, something else which seriously slays my life is Dollibox - who've won me over month after month with their pink beauty boxes packed full of goodies, unicorns and sparkle. And today's blog post focuses on August 2017's edit, so you can see why*. Dollibox is a fun beauty box, which serves up mostly full sized products each month. What I like most about their service is the variety of items included. Their boxes always ooze pink, glitter, unicorns [plus a few kawaii-esque items for extra cute measure] and I've seen them contain items of skincare, makeup, jewellery, wax melts and hair accessories. And I also love the price, of course. Cost wise, they have a few different subscription packages available - but the cheapest [and most popular] option is to grab some Dollibox action on their monthly plan; which is just £10 a box [plus P&P.] Which for 5, mainly full sized items [from some cracking brands, may I add] shipped right to your doorstep is unreal value. And cancellable at any time. Sold yet? You will be once you've seen August's curation of products. Which I'll finally f*cking show you now hahaha. Sorry, I'm in a rambling mood today. Don't know how / why I've worked testes and bumholes into a beauty post, but we here! I'm dead fussy with false lashes. I've been wearing them daily for so many years that I can totes spot a fit pair from a sh*t pair. And I'm really impressed with these Meow Lashes - which definitely stands for something coming from me. Presentation wise - these fluffy, soft lashes slide out of a hard, protective, plastic case; which is ideal for safely storing them in between uses. If stored and cared for properly. you can wear these lashes up to 25 times - which definitely makes me feel better about their £10+ price tag. I really like them. They're soft, fluffy yet spiky - the exact kinda style I go for in a falsie. They don't come with glue, but you can pick it up for so cheap in so many places that that isn't an issue for me at all. They're lightweight, without that dreaded heavy band and can be curled to lift your eyes. They're made from 100% Mink hair - which is 100% natural, ethically sourced and hypoallergenic too; making them one to watch. I love eggs. Bold statement, one which may be deemed questionable by many - but I really do, and always have. Scrambled, poached, hard boiled, fried... and now, on my face. With its cute packaging, this K-Beauty face mask from Bioaqua [a brand I've tried before in July's Dollibox] is something which piqued my interest from the get go. And, in case you're wondering, word on the street is that it doesn't smell like eggs. I've just not been able to try this for myself yet, as I've been held hostage in hospital for 14 days more than I expected, hahahah. This cracking mask is supposed to be egg-sellent at solving skin problems - from dehydration to uneven tone or oiliness. It's a sheet mask, which I quite enjoy, packed full of egg protein to hydrate, brighten and regulate oil in your face. Dollibox suggest keeping it in the fridge before use, for an extra shot of cooling calmness. Off to the egg tray I go! I love Technic - there's never a day goes by where I don't have at least 3 of their products on my face. They're an affordable, cruelty free, high quality brand and their prices are so affordable that it's hard to cope. You may remember I reviewed a few of their latest releases not so long ago - and I've actually got a few more since to share with you. But one step at a time lol - I'm typing this from a hospital bed! This palette is another testament as to why I love this brand so much - I own a few of their palettes now [their contouring and colour correction palettes being a couple of my main squeezes] and their formula and pigmentation [as well as design] is just incredible. These shades are super blendable and ideal to use for lightweight makeup looks this Summer. I bloody love these masks. I think this is the fourth one I've acquired in my life as an erratically posting blogger [you should totes check out my full on, dedicated declaration of love blog post on them too] - but you can honestly never have too many Space Masks. Their innovative design with ear loops, clever packaging & design and beautifully relaxing fragrance is honestly an experience sent from the Gods. Within minutes of opening up your Space Mask and popping it onto your face, you can feel the tension behind and around tired eyes start to relax; and the soft self heating properties of the mask itself just mellow you the absolute eff out. I had initially planned on saving this for when I went into hospital, but ended up caving and using it waaaaay before. They're just too good to not use immediately. My face is always tired. I really love the packaging of this deodorant - I had no idea what it was initially! Everything about it is so my aesthetic - I love the Aura font and the fact that it's a clean and natural BO defence system. And the fresh, zingy scent; of course. I'm a big advocate of natural deodorant products, as other more mass produced / commercial products on the market contain a sh*t tonne of artificial chemicals to achieve the same end result. I've started to think a lot more about what I put into / onto my body recently. Aura is a truly clean, award-winning deodorant which works with the body; rather than blocking it, supporting your natural detoxification process whilst providing all-day odour protection. Awake Organics' clever blend of uplifting botanicals smell beaut, nourish yo pits with organic goodness and don't block up your skin with Aluminium sh*te. I can't wait to put this to the test properly, when I'm back more active again. Can't work up much of a sweat at the moment, unless it's a particularly tense episode of Eastenders! And that's a wrap! August's Dollibox is one of my favourites from their recent offerings - one again, packing a wide variety of products into their signature pink box; which never fails to put a smile on my face when it lands on my doorstep each month. Some of my fave brands [such as Technic and Space Masks] have made the cut in August's edit - which I'm super happy about. And discovering Meow Lashes is another eye-opener, in terms of introducing me to new lash brands to stalk; as I'm really impressed with the pair in this box. And you's all know how much I love a good pair of falsies. 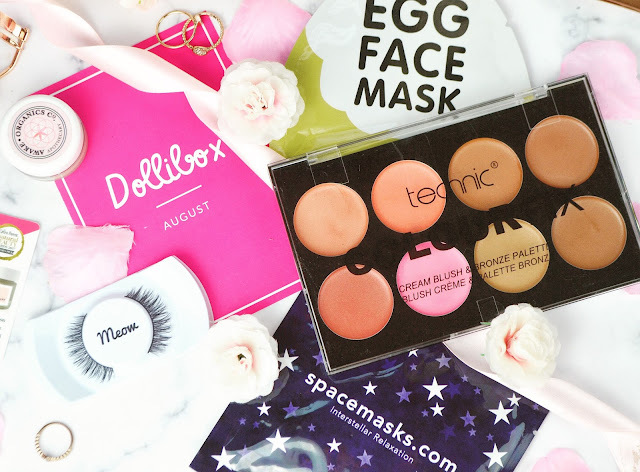 Have you tried Dollibox or any of the brands / products in August's edit before? Do you subscribe to any beauty boxes? Let's chat and that. *This post contains PR samples. Pink PR samples that truly I love and wouldn't mislead you about.